We flew from Amsterdam to Warsaw in the morning of Sunday 21st after attending to the Progdecennio gig the previous night in Zoetermeer. At Warsaw's Fryderyk Chopin airport we answered the question to the Polish immigration officer regarding the purpose of our visit to Poland saying: "To attend to a progressive rock concert at Club Stodola tonight and then touring". He said: "Ah, Pendragon?" This was the first indication that the band is well known and loved in Poland. We took a short rest at the hotel before coming to the venue, Club Stodola, which is the club of to the Warsaw Polytechnic University. So probably there were other engineers like us on the audience. We talked to Gary Chandler before the gig started and he told us that the Polish band Riverside had not arrived from Barcelona. Actually it was a shame because we were eager to see the band playing live and lots of local fans wearing Riverside t-shirts were disappointed too. The three albums of the band are highly recommended, especially the last one Second Life Syndrome. Gary Chandler and Steve Thorne opened the progfest playing a duo concert that began with There's A Light, the opening track of the excellent new Jadis album Photoplay. 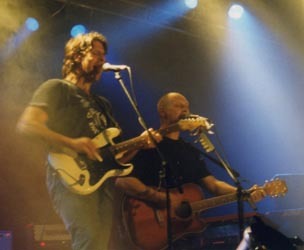 Gary was an enthusiast guitar player and had powerful vocals as usual. Steve went on with one of the tracks from his album and Gary followed with a classic Jadis track. Then Steve continued with Therapy and Gary closed the set playing another track from Photoplay. After a short intermission the Italian band Mind Key took the stage to present a progmetal style music. Another break to have a beer and then Quidam appeared on the stage with the new face of Bartek Kossowicz on the front. The creative musicians Zbyszek Florek on keyboards and Maciek Meller on guitar leaded the music, supported by Marlusz Ziolkowski on bass and Maciek Wroblewski on drums. They played a set of new songs from the new album SurEVival, which contained one instrumental medley of old songs which were traditionally sung by Emila. Another break to wait for the headliner Pendragon. 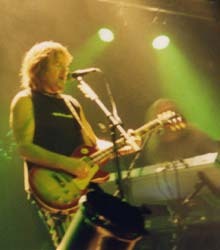 From the beginning of the show it was evident that Pendragon is highly appreciated by Polish fans who enthusiastically followed its music. When the lights were dimmed an into tape played Believe permitting the band to enter into the stage under a great ovation and began playing No Place For The Innocent and The Wishing Well, thus presenting a brilliant rendition of the new album Believe. Nick Barrett performance was impeccable with a great guitar playing, completed by Clive Nolan's precise keyboards and Peter Gee's alternating bass and keyboards. New young drummer Joe Crabtree was a nice surprise after so short time with Pendragon, playing as he had always been with the band. Under the expert hands of Rob Aubrey the sound was simply perfect and the colourful lights complemented perfectly the band's performance. Afterwards Pendragon continued with Nostradamus (Stargazing) and with an emotive version of The Edge Of The World, remembering Nick in the lyrics that he felt like standing at the edge of the world in Chile and Poland. For a couple of hours Chile and Poland were together at the edge of the world thanks to Pendragon music. Then the band played Dance Of The Seven Veils, Paintbox and the powerful Breaking The Spell. At that time it was after midnight and we were very tired after two long journeys, so we left the venue before the encores and returned to the hotel in Warsaw centre. It was a great night that made as feel very happy to travel so long to enjoy the music we like, this time with Polish fans. On the following days we had a nice time visiting Warsaw and travelling to Krakow too. As usual prog music and tourism are synonyms in our agenda.